The Days of Johann, an agility dog! : DVR Alert! Oprah to feature investigation into puppy mills! DVR Alert! 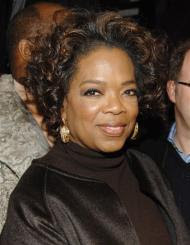 Oprah to feature investigation into puppy mills! CHICAGO (AP) — Oprah Winfrey plans to dedicate a show investigating abuses at puppy mills to her cocker spaniel, Sophie, who died last month from kidney failure. The show features special correspondent Lisa Ling investigating puppy mills, which Ling calls "horrific" and "haunting." Winfrey says the show is "for anybody anywhere who loves a dog, has ever loved a dog, or just cares about their basic right to humane treatment." While Sophie was not a product of a puppy mill, and Winfrey's three current dogs were adopted from breeders, Winfrey says in the future she would look to adopt from an animal shelter. "I would never, ever adopt another pet now without going to a shelter to do it. I am a changed woman after seeing this show," she says. For more information about puppy mills, read one of my previous posts. And visit Oprah's site to find out more information about her program and what you can do to fight back! Oprah, all eyes are on you...make us proud! I was so sorry when I heard that Sophie had passed away. I think Oprah is one of the most true dog lovers among celebrities. By the way - the flooring in the agility video was a very slippery normal carpet, like on every other indoor trial here. The clubs cannot afford more than that and we have very few sponsors. But that trial was very special because the club who organised it had floods last year and their equipment, club-house and course were destroyed. The other clubs then organised a charity trial for them and bought new equipment. This was the first trial on this new equipment.